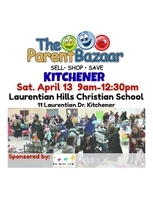 Come and sell your kids gently used items- gives you more space in your storage and puts cash in your pocket! Or come to shop for your kids and save $$ off retail and help out other parents! All tables are 6 feet in length. All spaces in the main gym are 8 x 4 Racks and additional tables are fine if they fit your space.